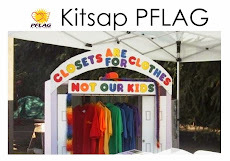 Due to the library being closed tomorrow we are changing our Kitsap PFLAG meeting location for this month. We are going to meet at Panera Breads in Silverdale like we did last year. We will meet at our usual time of 6:30, tomorrow (Monday) January 20th. We understand this is a different experience than our usual meeting, but we hope you can join us for this more social meeting. You have the option, but are not required, to order food. We will get some cookies or other treats to share.